Thanks to all who have donated toys to our Toy Drive. This year we partnered with Volunteers of America for their Season of Caring. distributed to children in need in Mobile and Baldwin Counties. 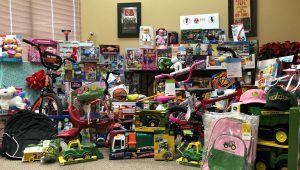 We are looking forward to taking these toys to Volunteers of America to help local Children in our area have a wonderful Christmas! Appreciation to all who have responded with such generosity.